Stiúrthóir agus léiritheoir scannán, scriptscríbhneoir agus ilcheardaí scannánaíochta ón tSeapáin ab ea Akira Kurosawa. Rugadh ar an 23 Márta 1910 i Shinagawa, Tóiceo é, agus shíothlaigh sé ar an 6 Meán Fómhair 1998 i Setagaya, Tóiceo. Stiúir sé 30 scannán ar fad, agus chaith sé leathchéad bliain ina stiúrthóir scannán. Áirítear ar stiúrthóirí móra a linne é. Sa bhliain 1989, bronnadh Duais an Acadaimh—"Oscar"—air as éacht a shaoil mar scannánaí. Saolaíodh Akira Kurosawa d'Isamu agus Shima Kurosawa i mbruachbhaile de chuid Thóiceo sa bhliain 1910. Ba eisean dríodar an chrúiscín, agus bhí triúr deirfiúracha agus ceathrar deartháireacha aige. Fuair fear de na deartháireacha bás sular rugadh Akira beag, agus bhí an nead tréigthe ag fear de na deartháireacha agus ag bean de na deirfiúracha cheana féin, freisin. Cailleadh bean de na deirfiúracha le galar nuair a bhí Akira deich mbliana d'aois. Bhí bua ealaíne in Akira ó bhí sé óg, agus múinteoir maith aige ar scoil a spreag é chun pictiúir a tharraingt is a líniú. Bhí tionchar ag a dheartháireacha Heigo agus Tachikawa ar Akira óg mar ealaíontóir freisin. Ábhar éirimiúil ealaíontóra a bhí i Heigo Kurosawa a bhain amach a lán duaiseanna ina scoláire óg dó, ach bhí an dá Heigo ann - bhí taobh eile a charachtair cineál dorcha nó ciniciúil. Sa bhliain 1923, rinne talamhchrith mór - chuaigh sé in annála staire na Seapáine mar Thalamhchrith Mór Kanto - rinne sé an-léirscrios timpeall ar Thóiceo, agus fuair céad míle duine bás san olltubaiste seo. Nuair a bhí Heigo agus Akira ar a gcamchuairt sa chathair i ndiaidh an ródaigh mhóir, bhí daoine marbha le feiceáil ina gcairn ar fud na háite. B'fhearr le hAkira gan radharc a fháil ar na marbháin, ach d'ordaigh Heigo dó féachaint orthu mar sin féin. Ina dhiaidh sin, d'inis Akira Kurosawa gur ceacht tábhachtach a bhí ann do stiúrthóir scannán, ó d'fhoghlaim sé aghaidh a thabhairt go cróga ar an rud a chuirfeadh eagla air, gan a shúile a dhúnadh. Sa deireadh, chuaigh Heigo le gnó na scannán - ar bhealach. Nó fuair sé post mar benshi, is é sin, mar chineál fear inste a mhíníodh imeachtaí an scannáin thostaigh don lucht féachana. Bhí an cheird seo tábhachtach go maith sa tSeapáin roimh theacht na scannán le fuaimrian. Nuair a tháinig an fuaimrian, áfach, bhí port na mbenshi seinnte. D'eagraigh Heigo stailc na mbenshi, ach ní raibh rath ar na stailceoirí. Faoi thionchar na stailce seo, áfach, chuir Akira spéis i gcúrsaí an lucht oibre agus scríobh sé cúpla alt d'iris radacach. Chuir Heigo lámh ina bhás féin nuair a bhí Akira fiche éigin bliain d'aois, agus go gairid ina dhiaidh sin, d'éag an deartháir ba sine a bhí ag Akira. Ní raibh aon duine eile fágtha den chlann mhac ach é féin anois. 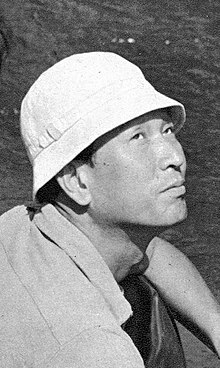 Sa bhliain 1936, chuala Akira Kurosawa go raibh clár printíseachta ag ceann de na stiúideonna móra scannánaíochta d'ábhair óga stiúrthóra. Fuair sé printíseacht ag an stiúrthóir Kajiro Yamamoto, agus sa bhliain 1943, rinne sé a chéad stiúrthóireacht féin, an scannán úd Sanshiro Sugata. Bhí an Dara Cogadh Domhanda díreach á fhearadh, agus cinsireacht na Seapáine ag coinneáil diansúile ar na chéad scannán a stiúir Kurosawa. Mar sin, ní raibh de rogha aige ach scannáin náisiúnaíocha fhrith-Iartharacha a dhéanamh. Nuair a baineadh slabhraí na cinsireachta de i ndiaidh an chogaidh, rinne sé scannán inar cháin sé saol na Seapáine sna tríochaidí - Waga seishun ni kuinashi, nó "Ní haithríoch linn ár n-óige". Is é is ábhar don scannán seo ná géarleanúint an fhreasúra sa tSeapáin le linn na deachtóireachta míleata - an dóigh ar caitheadh mic léinn i dtóin phríosúin i ndiaidh agóidí, agus cruachás a muintire siúd a fuair iad féin faoi ionsaí ag na húdaráis ar chúiseanna polaitiúla. Ina dhiaidh sin, rinne Kurosawa tuilleadh scannán faoi shochaí chomhaimseartha na Seapáine, mar atá, Youidore tenshi ("An tAingeal ar Meisce") agus Nora inu ("Madra seachráin"). Is é is ábhar don chéad cheann acu ná caidreamh an choirpigh óig a bhfuil eitinn air leis an dochtúir atá ag iarraidh é a leigheas. Sa dara ceann, tá rúcach óg bleachtaire san fhaopach: ghoid duine éigin a ghunnán uaidh le húsáid a bhaint as i ndúnmharú. Dúirt Kurosawa féin gur spreag saothar Georges Simenon é chun an scannán seo a dhéanamh, ach níor luaigh sé an scéal bleachtaireachta ar leith a bhí i gceist. Ba é an chéad scannán a thabhaigh cáil do Kurosawa taobh amuigh den tSeapáin féin ná Rashomon - scannán a bhí bunaithe ar chúpla scéal leis an scríbhneoir Seapánach Akutagawa Ryunosuke, "athair gearrscéalaíochta na Seapáine". Le fírinne, tá na scéalta seo ar fáil i nGaeilge fosta, a bhuí le Seán Ó Dúrois a d'fhoilsigh as Gaeilge iad sa bhliain 1995 (Rashoomon, gearrscéalta le Akutagawa Ryuunosuke, arna aistriú ag Seán Ó Dúrois. Coiscéim, Baile Átha Cliath 1995). Is iad na scéalta Rashoomon (lgh. 19-27 i leabhar Sheáin Uí Dhúrois) agus I bhFáschoill (lgh. 76-87 i leabhar Uí Dhúrois) is bun leis an scannán. Is é I bhFáschoill an scéal a insítear sa scannán, ach tá scéal fráma ann a bhfuil eilimintí áirithe den scéal úd Rashoomon le haithint air, go háirithe an geata ar hainmníodh an scannán as. Go bunúsach, déanann an scannán marana ar cheist na fírinne agus ar an dóigh a mbraitheann an fhírinne ar an té a insíonn í. Is éard an scéal atá i gceist ná ruathar an bhligeard sráide ar shamúraí agus a bhean chéile, ach insítear an scéal seo as peirspictíocht na ndaoine go léir a raibh páirteach sna himeachtaí, agus sa deireadh, iompaíonn sé amach nach bhfuil mórán i bpáirt ag na leaganacha éagsúla seo agus an dóigh a bhfuil siad ag teacht salach ar a chéile. Bhí cur chuige ar leith ag Kurosawa ina chuid scannánaíochta. Ba nós leis lionsaí teileafótacha a úsáid - is é sin, lionsaí a chuir ar a chumas na ceamaraí a chur i bhfad ar shiúl ó na haisteoirí - nó ar an dóigh sin, chreid sé nach mbeadh na haisteoirí meabhrach ar an gceamara. Bhaineadh sé úsáid as níos mó ná aon cheamara amháin le radharc aicsin a scannánú, freisin. Nuair nach raibh a fhios ag na haisteoirí cén ceamara a bhí á scannánú, ní iompóidís i leith an cheamara ar leith a bheadh i gceist. Bhí Kurosawa tugtha don aimsir mar ghléas le cur le hatmaisféar an scannáin, cosúil leis an mbáisteach throm i dtús Rashomon. Ar an láithreán scannánaithe, bhí Kurosawa cosúil le deachtóir, agus thugadh na haisteoirí Tenno - an tImpire - air, mar leasainm. Rachadh sé i dtuilleamaí gach sórt cleasaíochta leis an gcuma cheart a chur ar na himeachtaí. Ar Rashomon, mar shampla, dhathaigh sé an "bháisteach" le dúch peannaireachta lena chinntiú go mbeadh cuma na fearthainne troime uirthi. Ar an scannán úd Ran, tógadh caisleán iomlán ar shlios Shliabh Fuji - agus cuireadh an foirgneamh seo trí thine sa radharc is tábhachtaí. Foirfeoir fanaiceach a bhí ann i gcúrsaí na gcultacha freisin. Bhí sé inbharúla nach raibh sé ciallmhar culaith úrdhéanta a chur ar an aisteoir, nó ní chreidfeadh an lucht féachana gur leis an gcarachtar an chulaith sin i ndáiríre. Theastaigh uaidh go mbeadh gach aisteoir tar éis a rólchulaith a chaitheamh le cúpla seachtain anuas roimh an scannánú, ionas nach mbeadh coimhthíos air roimpi. Nuair a bhí sé ag scannánú Seachtar Samúraithe, d'ordaigh sé do na haisteoirí a bhí ag déanamh páirteanna na bhfeirmeoirí dearóile go mbeadh a gcuid rólchultacha ina mbratóga bochta sula dtosódh an scannánú. Ba nós le Kurosawa a chuid scannán a chur in eagar (a ghearradh) gan duine ar leith a fhostú le haghaidh eagarthóireachta. Maidir leis an gceol, bhí sé den tuairim nár chóir ceol críochnaithe a chur le scannán. Ina áit sin, roghnódh sé aon eilimint amháin - abair, na drumaí - as píosa áirithe ceoil agus bhainfeadh sé úsáid aisti sin mar chúlra dá scannán. Ní bhíonn ceol críochnaithe le cloisteáil ar a chuid scannán ach go gairid roimh an deireadh. Is iomaí cineál tionchar a d'imir ealaíontóirí éagsúla eile ar Akira Kurosawa. Is féidir plotaí William Shakespeare a aithint ar a lán scannán dá ndearna sé: tá imeachtaí Ran bunaithe ar King Lear, agus bhain sé úsáid as plota Mhic Bheatha ar an scannán Kumonosu-jō ón mbliain 1957. (Is é is ciall le teideal Seapáinise an scannáin ná "Caisleán na dTéad Damhán Alla", ach is é an teideal Béarla a fuair an scannán ná Throne of Blood, is é sin, "An Ríchathaoir Fola".) Is féidir eilimintí ó Hamlet a aithint ar an scannán Warui yatsu hodo yoku nemuru (The Bad Sleep Well, is é sin, "Bíonn codladh sámh ag na drochdhaoine"). Bhí scannáin eile le Kurosawa bunaithe ar shaothair le scríbhneoirí clasaiceacha Rúisise, cosúil le Hakuchi ón mbliain 1951 ("An tAmadán", nó The Idiot as Béarla, agus é bunaithe ar Идиот/Idiot le Fyodor Dostoyevskiy), Donzoko ón mbliain 1957 ("Thíos ar Íochtar", nó The Lower Depths as Béarla - ba é На дне/Na dne, an dráma le Maxim Gorkiy, a thug inspioráid don cheann seo), agus fuair Ikiru (teideal Béarla: To Live) ón mbliain 1952 spreagadh ón ngearrscéal fada Смерть Ивана Ильича/Smert' Ivana Il'icha ("Bás Ivan Il'ich") le Leon Tolstoy. Sa bhliain 1975, stiúir Kurosawa an scannán Dersu Uzala, agus ba é an leabhar dírbheathaisnéise leis an taiscéalaí Rúiseach Vladimir Arsenyev bunús an scannáin seo. 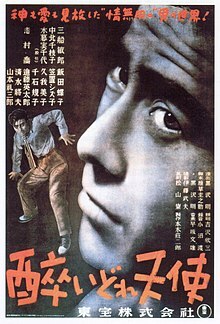 1948, Drunken Angel (酔いどれ天使, Yoidore tenshi). Maidir le Tengoku to jigoku ón mbliain 1963 (High and Low an teideal Béarla, ach is é is brí leis an teideal Seapáinise ná "Neamh agus Ifreann"), bhí plota an scannáin sin bunaithe ar an úrscéal The King's Ransom ("Airgead Fuascailte an Rí") leis an scríbhneoir scéalta bleachtaireachta Ed McBain. Is féidir go raibh an scannán Yojimbo bunaithe ar Red Harvest ("Fómhar Fola") le Dashiell Hammett, agus ar a laghad, ní deacair tionchar na scannán Meiriceánach faoin Iarthar Fiáin a aithint air. Bhí Kurosawa an-tugtha do shaothar Georges Simenon freisin, agus deireadh sé riamh gur iarracht a bhí i Nora inu (Stray Dog, "Madra seachráin") scannán a dhéanamh a chuirfeadh stíl scríbhneoireachta Simenon i gcuimhne don lucht féachana. Bhí an-suim ag Kurosawa i saothar Frank Capra, William Wyler, agus Howard Hawks, agus ar ndóigh, d'fhoghlaim sé a cheird ó Kajiro Yamamoto, rud a d'fhág a lorg ar a chuid scannán. De na stiúrthóirí Meiriceánacha, áfach, ba é John Ford an duine ba mhó a thuill adhradh Kurosawa. Theastaigh ó Kurosawa, fiú, spéaclaí dubha a chaitheamh le haithris a dhéanamh ar Ford. Nuair a bhí Seachtar Samúraithe á scannánú, d'iarr Kurosawa ar Yoshio Tsuchiya, duine de na haisteoirí, hata den chineál chéanna a fháil dó agus an ceann a chaith Ford nuair a casadh ar Kurosawa é. D'athscannánaigh an stiúrthóir Meiriceánach John Sturges scéal "Seachtar Samúraithe" a shuigh sé i dtimpeallacht an Iarthair Fhiáin - The Magnificent Seven atá ar scannán Sturges, agus tháinig sé ar an scáileán sa bhliain 1960. Ceithre bliana ní ba deireanaí, rinne Martin Ritt The Outrage, scannán eile faoin Iarthar Fiáin, agus é bunaithe ar shaothar Kurosawa - Rashoomon. Maidir le Yojimbo, tharraing Sergio Leone air nuair a rinne sé a scannán A Fistful of Dollars ("Dornán dollar"), ceann de na scannáin Iodálacha faoin Iarthar Fiáin, sa bhliain 1964. Níor iarr sé cead ar Kurosawa an scannán seo a dhéanamh, áfach, agus mar sin chuir Kurosawa an dlí ar Leone ar chúiseanna cóipchirt. 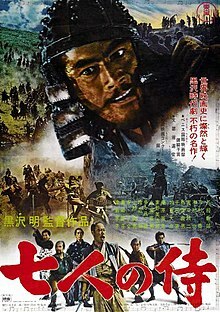 ↑ "Akira Kurosawa: Beathaisnéis". Bfi.org.uk. Tugadh an leathanach seo cothrom le dáta an 1 Meán Fómhair 2018 ag 21:49.